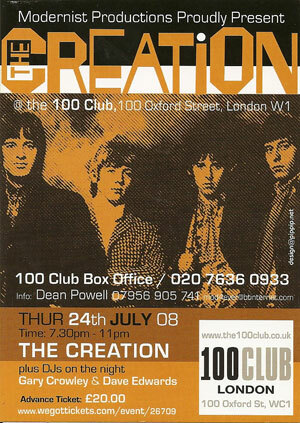 Mod/beat legends The Creation are back together for a gig – at London’s 100 Club. The date for your diary is 24th July 2008, running from 7:30pm until 11pm, with DJ support from Gary Crowley and Dave Edwards. Tickets are a fairly hefty £20 and available from the link below. Or find out more at the 100 Club website.